I've used it a couple of times on here, and I'm sure you'll keep seeing it pop up here and there. And recently I got a question about what, exactly, this mysterious substance is - this asafoetida, this hing - that I keep referring to. You'll find it in Indian grocery stores tucked amongst the spices, looking innocuous. Even in bulk stores though, you'll never see it just hanging out with the other spices - its fragrance (odor?) when raw is pretty overpowering, and can overwhelm any other spices with which it is stored. But don't be scared if you get that first pungent whiff! When you add a sprinkle while cooking with oil or ghee, suddenly the flavors bloom and it adds a little subtle something to your dish - something a little oniony, a little garlicky, a little sulfury - a little umami perhaps? This is a friendly spice, folks. Never liking to hang out by itself, always blending in with the group. You'd never think to miss it, but you'll notice if it isn't present. But if you put this introverted spice in the spotlight - perhaps an entire tablespoon instead of a fourth of a teaspoon won't be so bad you think - disaster! Overwhelming ain't the word for it. But used sparingly, it can even have medicinal effects! So use well, but use carefully. Asafoetida adds a delectable depth to all kinds of dishes if you take the time to learn how to play with it. Read more about it here, here, and here. 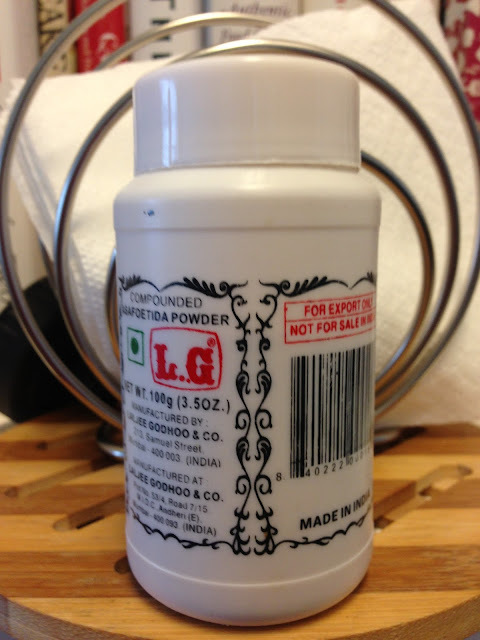 And if you're in New York, you can buy it at any of the Indian stores around town, including Little India Stores. Or of course, buy it on Amazon like everything else!